In Greek mythology, the legendary inventor Daedelus served as something of a patron saint for sculptors. So it's apropos that prodigiously talented Santa Monica-based producer Alfred Weisberg-Roberts has cribbed that name as his alias. 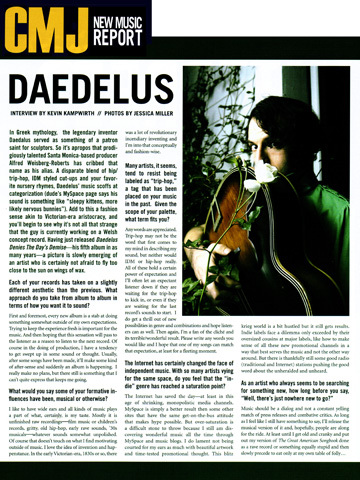 A disparate blend of hip/trip-hop, IDM styled cut-ups and your favorite nursery rhymes, Daedelus' music scoffs at categorization (dude's MySpace page says his sound is something like "sleepy kittens, more like nervous bunnies"). Add to this a fashion sense akin to Victorian-era aristocracy, and you'll begin to see why it's not all that strange that the guy is currently working on a Welsh concept record. Having just released Daedelus Denies the Day's Demise - his fifth album in as many years - a picture us slowly emerging of an artist who is certainly not afraid to fly too close to the sun on wings of wax. Each of your records has taken on a slightly different aesthetic than the previous. What approach do you take from album to album in terms of how you want it to sound? First and foremost, every new album is a stab at doing something somewhat outside of my own expectations. Trying to keep the experience fresh is important for the music. And then hoping that this sensation will pass to the listener as a reason to listen to the next record. Of course in the doing of production, I have a tendency to get swept up in some sound or thought. Usually, after some songs have been made, it'll make some kind of after-sense and suddenly an album is happening. I really make no plans, but there is still something that I can't quite express that keeps me going. What would you say some of your formative influences have been, musical or otherwise? I like to have wide ears and all kinds of music plays a part of what, certainly, is my taste. Mostly it is unfinished raw recordings - film music or children's records, gritty, old hip-hop, early rave sounds, '30s musicals - whatever sounds somewhat unpolished. Of course that doesn't touch on what I find motivating outside of music. I love the idea of invention and happenstance. In the early Victorian-era, 1830s or so, there was a lot of revolutionary incendiary inventing and I'm into that conceptually and fashion-wise. Many artists, it seems, tend to resist being labeled as "trip-hop," a tag that has been placed on your music in the past. Given the scope of your palette, what term fits you? Any words are appreciated. Trip-hop may not be the word that first comes to my mind in describing my sound, but neither would IDM or hip-hop really. All of these hold a certain power of expectation and I'll often let an expectant listener down if they are waiting for the trip-hop to kick in, or even if they are waiting for the last record's sound to start. I do get a thrill out of new possibilities in genre and combinations and hope listeners can as well. Then again, I'm a fan of the cliché and its terrible/wonderful result. Please write any words you would like and I hope that one of my songs can match that expectation, at least for a fleeting moment. The Internet has certainly changed the face of independent music. With so many artists vying for the same space, do you feel that the "indie" genre has reached a saturation point? The Internet has saved the day - at least in this age of shrinking, monopolistic media channels. MySpace is simply a better result than some other sites that have the same get-on-the-bus attitude that makes hype possible. But over-saturation is a difficult stone to throw because I still am discovering wonderful music all the time through MySpace and music blogs. I do lament not being courted for my ears as much with beautiful artwork and time-tested promotional thought. This blitz krieg world is a bit hustled but it still gets results. Indie labels face a dilemma only exceeded by their oversized cousins at major labels, like how to make sense of all these new promotional channels in a way that best serves the music and not the other way around. But there is thankfully still some good radio (traditional and Internet) stations pushing the good word about the unheralded and unheard. As an artist who always seems to be searching for something new, how long before you say, "Well, there's just nowhere new to go?"